Despite pipelines in the North Sea and Libya coming back online in 2018, oil has remained above $60 in the new year. 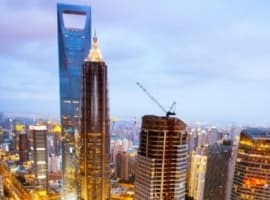 These high prices have largely been driven by geopolitical fears across the globe. - 2017 was a year of record-breaking U.S crude oil exports. In 2016, the U.S. averaged crude exports of 520,000 bpd, but that figured more than doubled to 1.1 million barrels per day (mb/d) by February 2017, only to hit higher levels as the year wore on. - Canada remained the top buyer of U.S. crude, as proximity and pipeline interconnections made it an obvious destination. 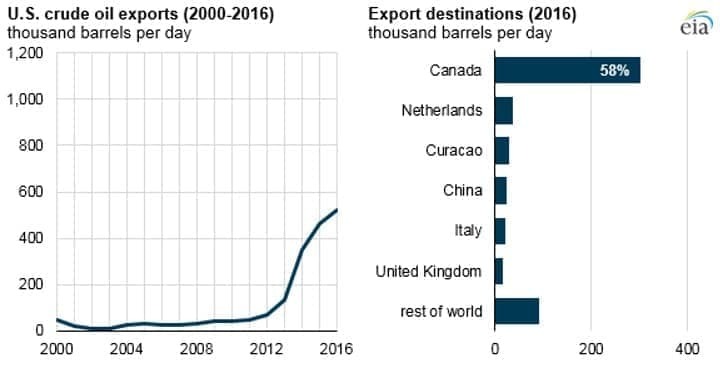 - But other buyers of American crude emerged in 2017, including the Netherlands, Curacao and China. • BP (NYSE: BP) and Royal Dutch Shell (NYSE: RDS.A) have suggested that the U.S tax overhaul would be positive in the future, but would lead to one-time charges in the fourth quarter of 2017. • The Forties pipeline is now fully operational. "All restrictions on the flow of oil and gas from platforms feeding into the pipeline system have been lifted and virtually all platforms are now on line," operator Ineos said in a statement on December 30. • Rising oil prices would benefit shale companies that have relatively less hedging, exposing them to a more positive market. Cowen analysts singled out Anadarko Petroleum (NYSE:APC), EOG Resources (NYSE:EOG) and Continental Resources (NYSE:CLR) as potential winners. Oil prices started out the year with some bullish sentiment related to geopolitical flashpoints, while the market fundamentals looked less favorable with the restoration of some key pipelines. Tension over North Korea. The saga over North Korea’s nuclear program continues to take new twists and turns. The latest disturbance comes after news that Russian oil tankers helped send oil to North Korea, which would be a violation of UN sanctions. The U.S. has also accused China of violating UN sanctions by shipping crude oil to the isolated North Korea regime. Forties pipeline back online; Libya too. The return of the Forties pipeline to operation and the restoration of output from North Sea oilfields removed one of the recent bullish catalysts from the oil price equation. Libya’s pipeline outage also came to an end after the damaged pipeline was repaired. So far, the bearish news of resumed oil flows in the North Sea and Libya has been outweighed by the protests in Iran. Venezuela to launch oil-backed cryptocurrency. The Venezuelan government has said that within days it will launch a new cryptocurrency backed by its 5.3 billion barrels of oil reserves. "Camp one of the Ayacucho block will form the initial backing of this cryptocurrency," Jorge Rodriguez, Venezuela’s communications minister told reporters, referring to a section of the country’s southern Orinoco Belt. "It contains 5.342 billion certified barrels of oil. We're talking about backing of $267 billion.” Few analysts think that Caracas can successfully stage a new cryptocurrency or that it would help the beleaguered government in any real way. Drilling costs to rise in 2018. 90 percent of oil producers surveyed by Barclays say that they expect the cost of drilling and producing oil will rise this year. Nearly two-thirds expect the cost of oilfield services to rise by as much as 10 percent. And roughly half of the respondents expect cost inflation to eat away 75 percent of the efficiency gains that the industry has achieved in recent years. A growing number of companies also think that the efficiency gains are at least 25 to 50 percent structural, rather than cyclical. And finally, more than half of the respondents said that they expect to spend within their cash flow this year. Saudi Arabia boosts gasoline prices. As part of the Kingdom’s wide-reaching economic reforms, the Saudi government has hiked gasoline prices at the start of the year, raising them from 0.75 riyals to 1.37 riyals per liter for Octane 91. Russian gas production hits record high in 2017. Russian natural gas production rose by 7.9 percent last year to a record high, edging out the previous high set in 2011. Russia also has more projects in the works, which could allow it to continue to boost output and rival the U.S. for the top spot. New and planned LNG export terminals provide more outlets for Russian gas, while shipments via pipeline to Europe are also on the rise. +$60 oil needed for new round of rig count additions. 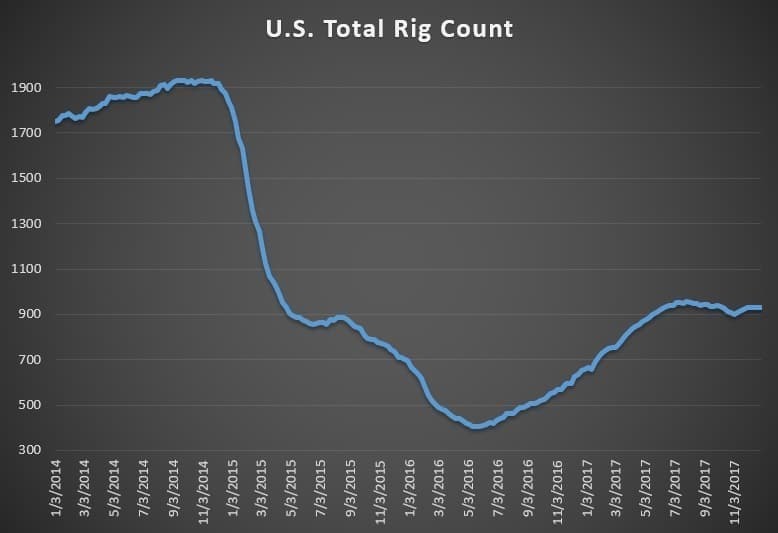 A survey from the Dallas Fed finds that oil executives believe that WTI will need to stay above $60 per barrel if the rig count is to continue to climb. The survey finds that the industry believes oil will need to trade between $61 and $65 per barrel if the rig additions are to rise significantly from current levels. North Dakota oil production up, aided by pipeline. The WSJ notes that the beginning of operations at the Dakota Access pipeline has lowered the cost of shipping crude from the Bakken to the Gulf Coast, while also adding capacity. The early results are positive – North Dakota crude oil production hit a new peak in October at 1.185 mb/d, and output is up 135,000 bpd since the start of the pipeline.